Oral Pain. It’s so awful. Most of us have experienced it at some point in our lives. If not as adults, then definitely as children, and it’s incredibly hard for parents to see their babies in pain. Thankfully, Sweet Toddler hasn’t had too rough-a-go of things… until now. Canine teeth. Those damn dog teeth! I have heard them described before as the “angry teeth.” Those sharp, wiley little suckers can wreak havoc in an unsuspecting home faster than you can say, “what the ________?” Angry teeth they are, and they make for one angry and sad little toddler. All of my fail-safe methods of her younger days weren’t seeming to work, so what’s a mama to do? Break out the big guns. The essential oil arsenal. Using two essential oils and a carrier oil, I quickly made an herbal “Orajel” that helps relieve pain without all of the nasty chemicals. In a small dish, heat coconut oil gently until melted. Add essential oils and stir. Pour into a small container, (such as this one), and allow to cool. 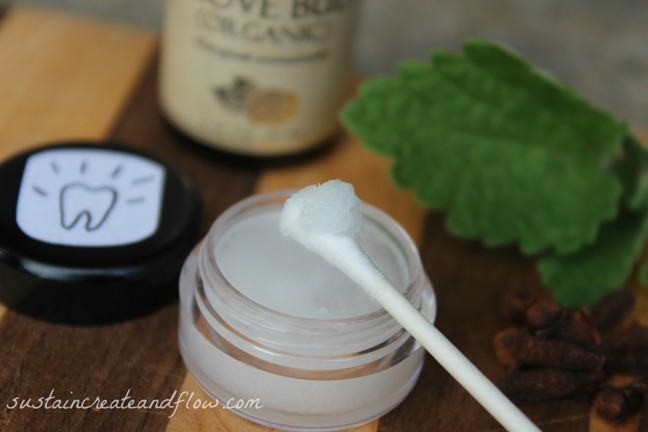 To apply, scoop salve onto a q-tip and apply to affected area. Repeat as needed. *Tip: If you hold the q-tip in your mouth for a few seconds, your body heat will be just enough warmth to slightly melt the coconut oil a bit and it makes it easier to scoop. I tested this on myself and it is just the right strength for Sweet T. For younger babies, you may want to dilute the essential oils more by using more coconut oil, and for adults, you may want to strengthen it by adding just a couple more drops of essential oils. What a great idea! 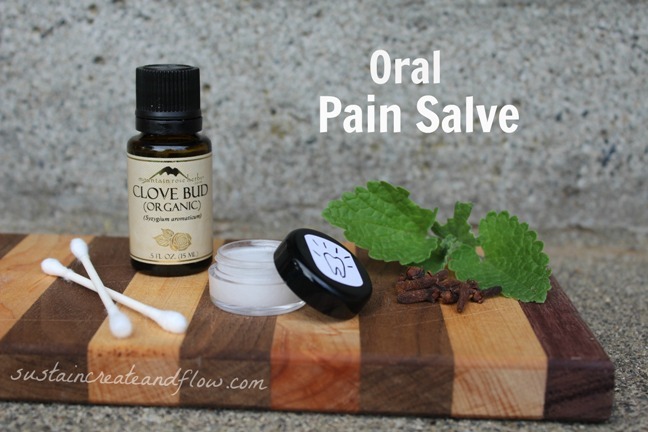 I’ve heard of chewing on a clove bud or using the oil but this seems like a much better solution. I think I might have stumbled upon this just in time! My grandson is just starting to cut his “angry” teeth. I will be buying the ingredients this weekend to make some for him.